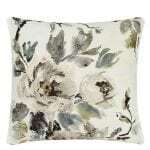 Delicately printed peonies in shades of ecru and gray cover the lovely Shanghai Garden dec pillow by Designers Guild. The reverse is a coordinating stone color linen. Trimmed with white satin border. A popular pillow at Bedside Manor!